Hubs and I took a trip back east, visiting family in PA and MD. While visiting my folks in PA, I stopped at Simply Stashing in Littlestown. Every time we drive to Hanover, PA I do declare that shop is closed when we pass it in the evening, and it has not yet opened when we head back home in the morning hours. Usually I don’t fit in a stop at the quilt shop, but managed to this time. I told my husband I was popping in to ask for their Row by Row pattern, a cute Flying Geese pattern. Of course I had to look around while there. 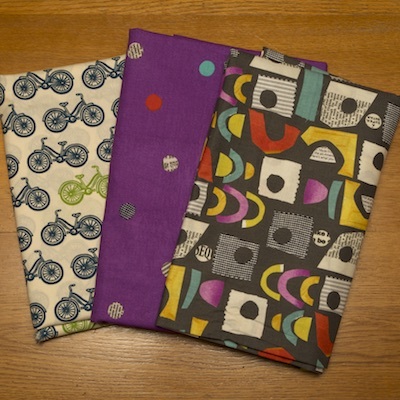 I found the bicycle fabric which I could not pass up. And those two fun prints were on their discount wall. While checking out, the gal asked if I would be visiting other quilt shops in the area. I asked where they are located and one she mentioned is in Hanover. It ends up that it is just around the corner from the retirement community where my parents live! (Ok, around the corner in a country mile.) My folks have lived there for 11 years! And I never known about this shop! I do recall passing a shop last year with a Bernina sign, and wrongly assumed it was just machines. Nope, it is a nice quilt shop too! Danners Bernina Shoppe. 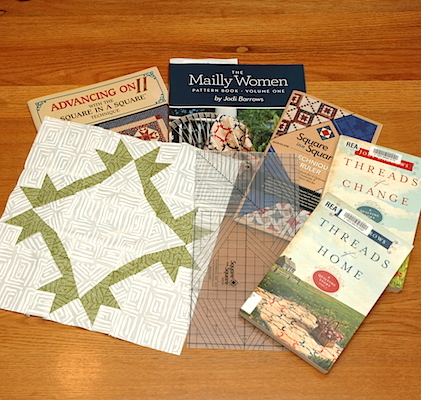 I bought a book that goes along with the Westalee quilting rulers I own, and another ruler. With practice, I hope to up my ruler work using my Baby Lock Tiara III sit down quilting machine. Sneak peak of the Facets quilt. Design by Christa Watson. The top is completed and measures 88″ x 84″ enlarged from the original pattern to fit my son’s bed. I don’t have the back or binding prepared yet, but the top now goes into my ‘to be quilted’ pile. I’m so happy to check the making of this quilt top off my ‘to-do’ list! 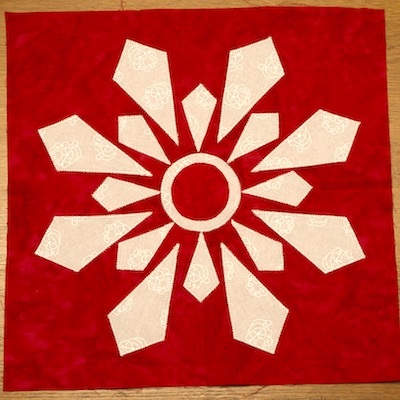 While cruising some quilting websites back in July, I came across a Christmas block Quilt Along. This snow flake was the first block presented August 1st. 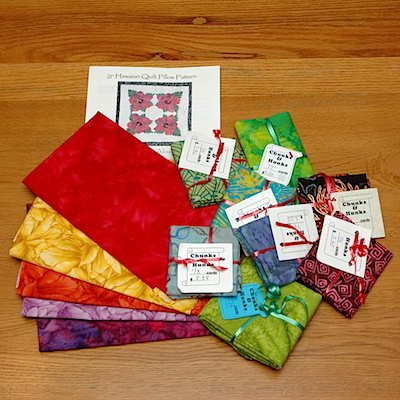 The quilt along is called I Wish You a Merry Quilt-Along. I’ll be keeping an eye out for the upcoming designs presented, but with a personal reality check, I’m realizing I should just not join another quilt along right now! … she said backing away from the internet! I finished a quilt today! Yesterday I completed the straight stitch quilting, and today I attached the binding. 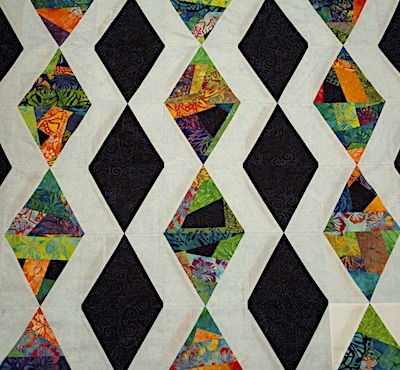 This quilt design is On The Wave from Sew All Around Quilt Along. I love this fun back used on my little wall hanging. It measures 30″ x 34″. Safely travel to PA to visit my folks. ✔️ We also visited relatives in MD and IN. Gift Monkey quilt to young nephew. ✔️ Happily gifted! Start cutting pieces for next quilt top on my list- Tropical Snowball. 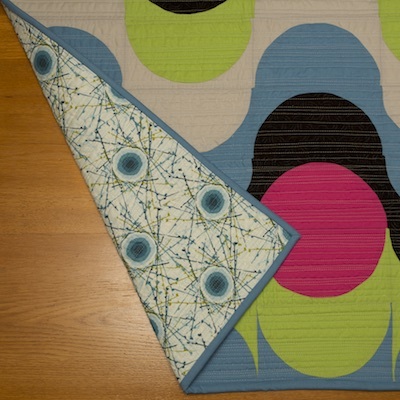 Sandwich baby quilt and begin quilting – a friend’s quilt. While vacationing for 2 weeks on Oahu and The Big Island, I visited 6 quilt shops. 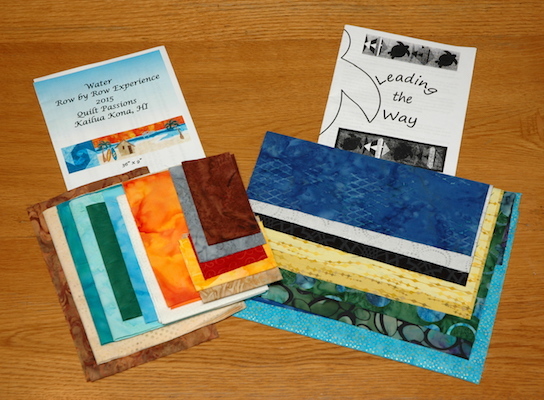 My favorite were Quilt Passions in Kailua-Kona and Kilauea Kreations II in Hilo. Above are the Row by Row Experience 2015 Kits I bought from my 2 favorite shops. There are so many lovely flowers in Hawaii! Plumeria was blooming in many different colors! 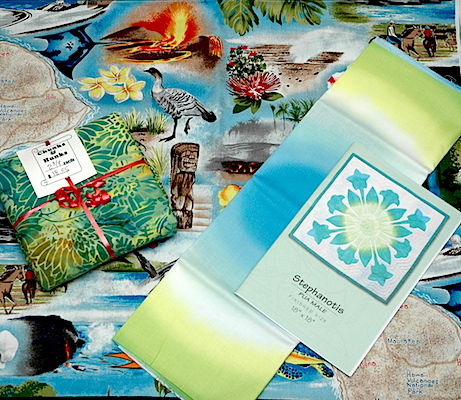 I was happy to find a local quilt designer had created many lovely appliqué and Sashiko stitched patterns inspired by the many plants found on the Hawaiian Islands. 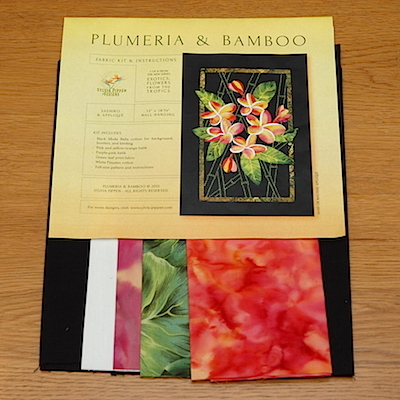 I bought the Plumeria Kit. 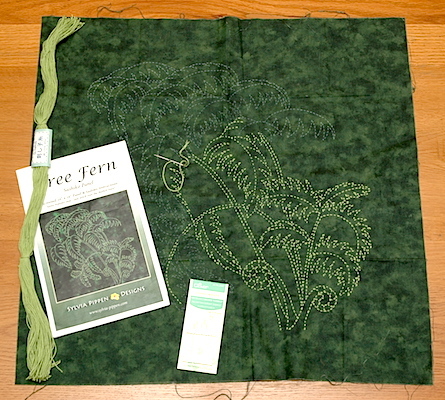 And also bought the Tree Fern Sashiko Panel. The Tree Fern was one of my husband’s favorite plants. Once finished, I plan on giving this to him to hang in his office at work. Another kit I could not resist, was the Tropical Snowball in Batiks from Quilt Passions. 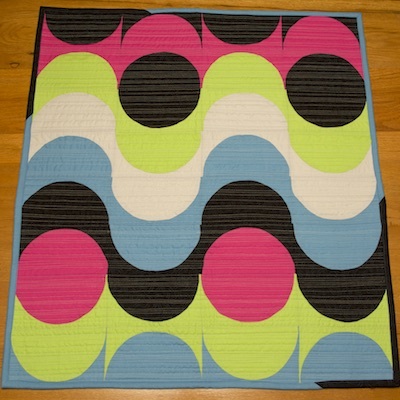 I do love circle quilts! More fun! Another local artist with hand dyed fabric and a traditional Hawaiian Appliqué. This is just pillow size, so I figure I’ll give it a whirl. The fabric in the background was designed by Quilt Passions and depicts common scenes on the Big Island. 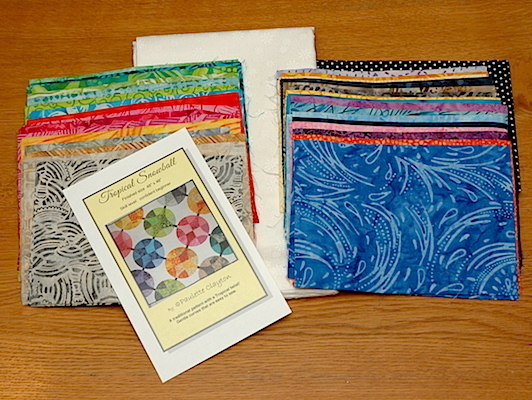 Of course I had to pick up a few goodies to share with my quilting friends! Thursday we are having a quilting day at my house, and I’m eager to see if my friends like what I have purchased for them! These lovelies came from my Daughter-in-law and her mother as they traveled through Indiana, Illinois, and Missouri. They stopped at 12 shops to pick up Row by Row Experience Patterns and also bought some Fat Quarters for me! How sweet! 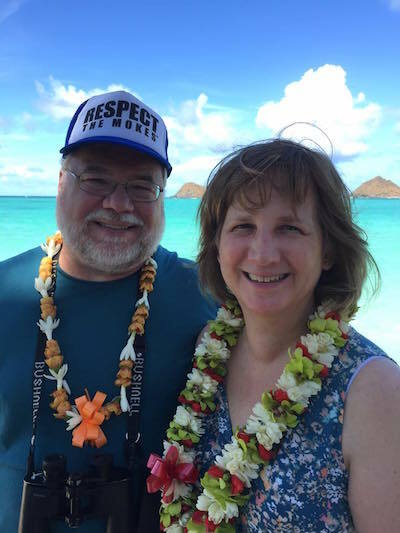 Once home from Hawaii, I had a few days before heading to the hospital for a planned surgery. While recovering, I read lots of library books including Threads of Change and Threads of Home by Jodi Barrows. Plus a week ago, I got to go to a Jodi Barrows lecture and trunk show. And finally back to sewing, I jumped right in and tried my hand at Jodi’s Square in a Square method of block construction making a Liz’s Gift block. Yep, I jumped right in with an advanced block. I need to back up to the basic units to get all those measurements and points right! I’m linking up to To-Do Tuesday and Linky Tuesday. Part of July and August my husband and I traveled to Oahu Hawaii. It was a great trip. We stayed with my sister and brother-in-law. And were also treated to a trip by them to the Big Island. 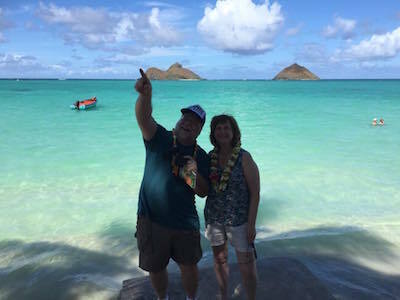 This is Lanikai Beach, Kailua with the Mokes behind us. Look at the turquoise water! So lovely! Hubs being silly. Ready for some sight seeing! 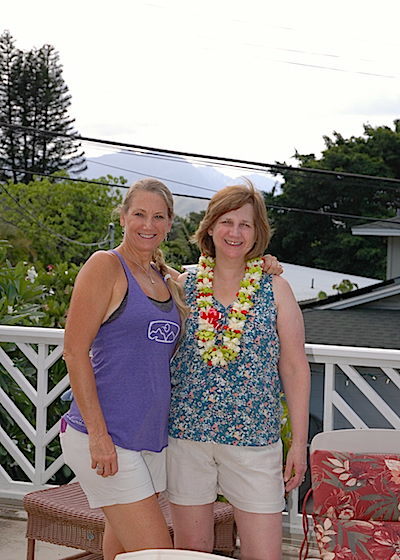 My sister, Lauren, and I on her lanai. Mountains in the background, turn to the right and you could see Kailua Bay just one block away! 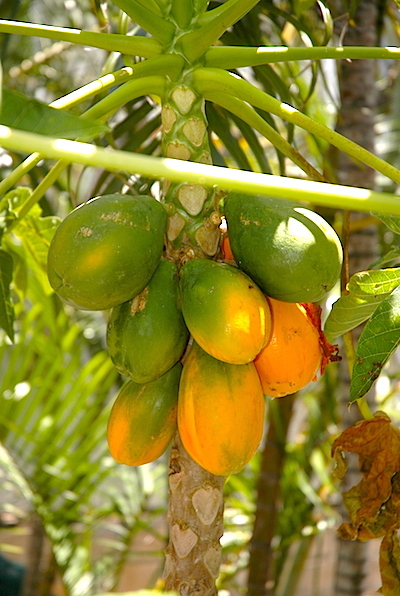 Fresh papayas for breakfast from my sister’s tree! 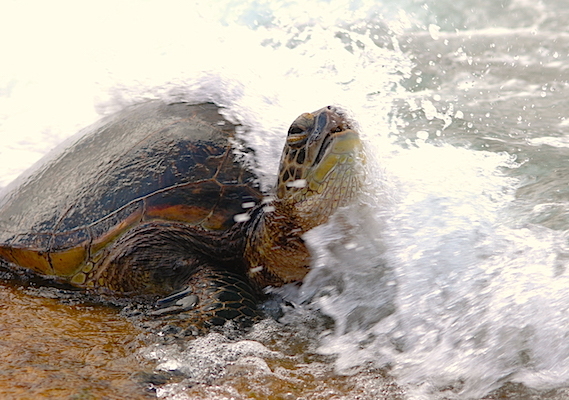 One of my favorite days was when we found a beach along the North Shore where sea turtles were feeding on the algae. We counted 30 Honu! The Big Island! 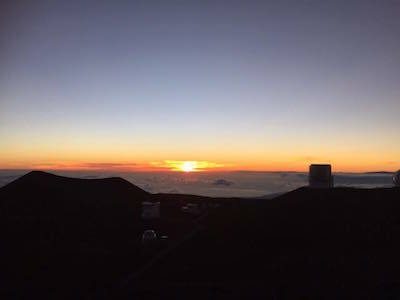 Mauna Kea Sunset. It was in the 40s on top of the mountain. Brrr, after a day in the upper 80s along the shore line. 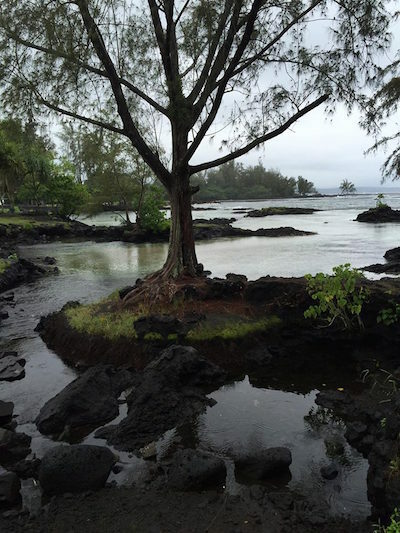 Carl Smith Park, Hilo. We needed another day to have time to swim in the tide pools. 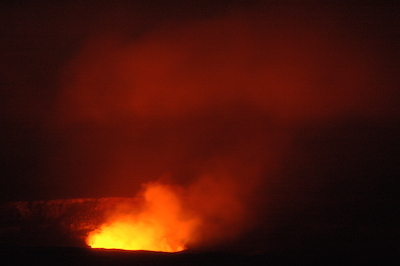 The volcano at night, Hawaii Volcanoes National Park. 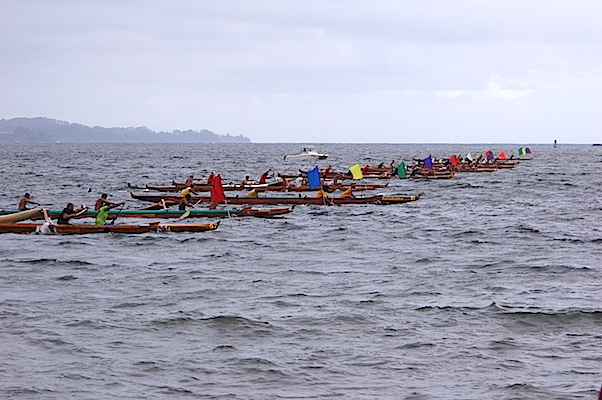 The reason for the trip to the Big Island was for the HCRA State Canoe Championship 2015. 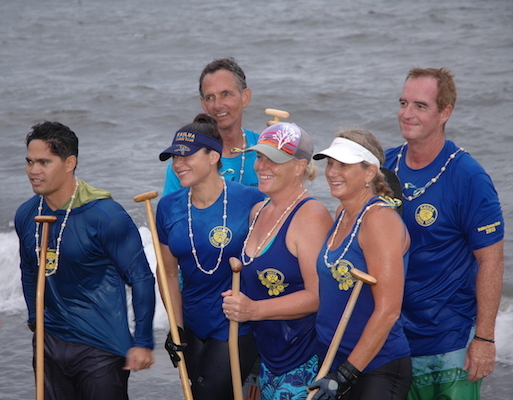 My sister paddled in the Mixed Race, 3 men 3 women. The team (my sister on the right), coach in light blue in back. And yes! I did make it to several quit shops! 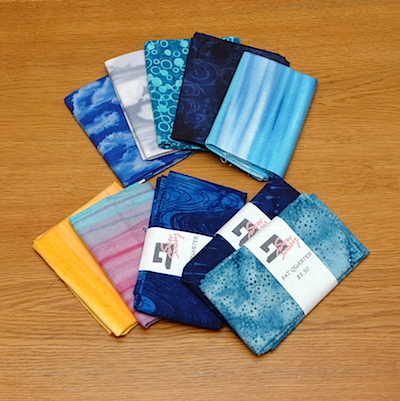 I bought two Row by Row Experience 2015 kits from Kilauea Kreations II in Hilo and from Quilt Passions in Kailua Kona. I visited several other shops: Fabric Impressions in Hilo, Kilauea Kreations in Volcano, and Fabric & Quilting Delights in Kailua Kona. 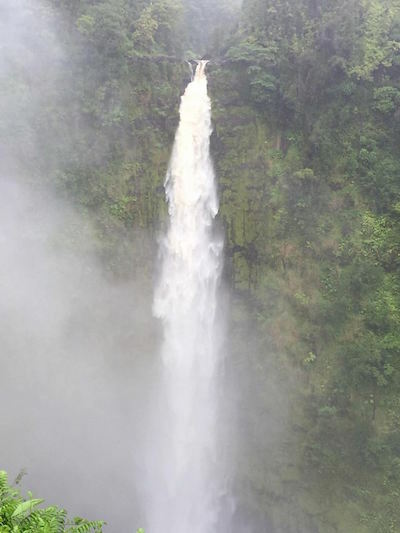 I didn’t make it to Topstitch in Kampala or H. Kimura, Inc. in Kealakekua. On Oahu, I only fit in one quilt shop visit to Calico Cat in Honolulu. So many more quilt shops and islands to visit! Maybe we will make it back one fine day!